If you know where to find a good plastic-free shampoo, can you tell Jeanne Haegele? Last September, the 28-year-old Chicago resident resolved to cut plastics out of her life. The marketing coordinator was concerned about what the chemicals leaching out of some common types of plastic might be doing to her body. She was also worried about the damage all the plastic refuse was doing to the environment. So she hopped on her bike and rode to the nearest grocery store to see what she could find that didn't include plastic. "I went in and barely bought anything," Haegele says. She did purchase some canned food and a carton of milk--only to discover later that both containers were lined with plastic resin. "Plastic," she says, "just seemed like it was in everything." She's right. Back when Dustin Hoffman received the most famous one-word piece of career advice in cinema history, plastic was well on its way to becoming a staple of American life. The U.S. produced 28 million tons of plastic waste in 2005--27 million tons of which ended up in landfills. Our food and water come wrapped in plastic. It's used in our phones and our computers, the cars we drive and the planes we ride in. But the infinitely adaptable substance has its dark side. Environmentalists fret about the petroleum needed to make it. Parents worry about the possibility of toxic chemicals making their way from household plastic into children's bloodstreams. Which means Haegele isn't the only person trying to cut plastic out of her life--she isn't even the only one blogging about this kind of endeavor. But those who've tried know it's far from easy to go plastic-free. "These things are so ubiquitous that it is practically impossible to avoid coming into contact with them," says Frederick vom Saal, a biologist at the University of Missouri. Vom Saal is a prominent member of a group of researchers who have raised worrisome questions in recent years about the safety of some common types of plastics. We think of plastic as essentially inert; after all, it takes hundreds of years for a plastic bottle to degrade in a landfill. 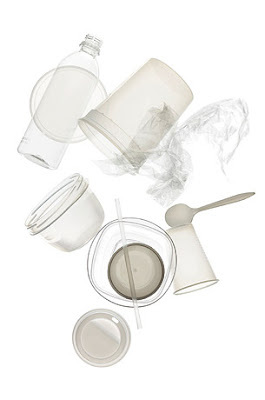 But as plastic ages or is exposed to heat or stress, it can release trace amounts of some of its ingredients. Of particular concern these days are bisphenol-a (BPA), used to strengthen some plastics, and phthalates, used to soften others. Each ingredient is a part of hundreds of household items; BPA is in everything from baby bottles to can linings (to protect against E. coli and botulism), while phthalates are found in children's toys as well as vinyl shower curtains. And those chemicals can get inside us through the food, water and bits of dust we consume or even by being absorbed through our skin. Indeed, the Centers for Disease Control and Prevention reported that 92% of Americans age 6 or older test positive for BPA--a sign of just how common the chemical is in our plastic universe. Scientists like vom Saal argue that BPA and phthalates are different from other environmental toxins like lead and mercury in that these plastic ingredients are endocrine disrupters, which mimic hormones. Estrogen and other hormones in relatively tiny amounts can cause vast changes, so some researchers worry that BPA and phthalates could do the same, especially in young children. Animal studies on BPA found that low-dose exposure, particularly during pregnancy, may be associated with a variety of ills, including cancer and reproductive problems. Some human studies on phthalates linked exposure to declining sperm quality in adult males, while other work has found that early puberty in girls may be associated with the chemicals. Does that mean even today's minuscule exposure levels are too much? The science is still murky, and human studies are few and far from definitive. So while Canada and the Democratic Republic of Wal-Mart are moving to ban BPA in baby bottles, the Food and Drug Administration maintains that BPA products pose no danger, as does the European Union. Even so, scientists like Mel Suffet, a professor of environmental-health sciences at the University of California, Los Angeles, say avoiding certain kinds of plastics is simply being better safe than sorry. As researchers continue to examine plastic's impact on our bodies, there's no doubt that cutting down on the material will help the environment. Plastic makes up nearly 12% of our trash, up from 1% in 1960. You can literally see the result 1,000 miles (1,600 km) west of San Francisco in the Great Pacific Garbage Patch, a swirling mass of plastic debris twice the size of Texas. The rising cost of petroleum may get plastic manufacturers to come up with incentives for recycling; current rates stand at less than 6% in the U.S. But the best way to reduce your plastic impact on the earth is simply to use less. Here's how. You can avoid plastic bottles and toys labeled with the numbers 3 or 7, which often contain BPA or phthalates, and steer clear of vinyl shower curtains and canned foods--especially those with acidic contents like tomatoes. Vom Saal counsels that the cautious should also avoid heating plastic in microwaves. But get rid of the stuff altogether? "It's hard to go all the way," says Haegele, who, 10 months into her experiment, is leading a mostly plastic-free life. Although she still uses a plastic toothbrush, she's experimented with her own toothpaste (made of baking soda, cinnamon and vodka; for the recipe, go to her blog, lifelessplastic.blogspot.com She has used vinegar for conditioner and is searching for a decent shampoo that doesn't come in a plastic bottle. She has tried soaplike bars of shampoo, but they make her hair feel sticky. Plus, they sometimes come wrapped in--you guessed it--plastic.